At first, I didn’t have much inspiration for this quilt, but as time moved on ideas started to present themselves and I settled on designing something based around the ‘Silk Road’. 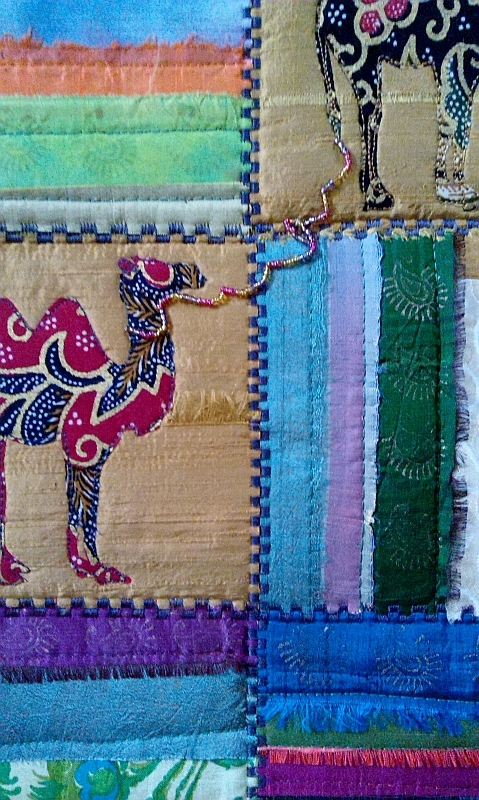 My first thought was to use the elephant motif, one which I have used many times in the past, but on reading about the Silk Road, it was obvious that I must change this notion as the animals used were mainly horses and camels, so thinking the camel motif easier to interpret than a horse, I went for the camel. Also, the shape is a little more interesting to me. This quilt is almost exclusively made using various silks and silk threads, which I adore, but I did use cotton for the backing and the wadding. I decided on square shapes, which I made individually, and once I had all the sizing correct, I attached them to a fine piece of silk, which had been covered with fine misty fuse. It was then layered up with wadding and backing, so this quilt has four layers, instead of my usual three. I don’t know if I will use this method again, because pressing the squares to the bonded silk did seem to dull the colours slightly. Where possible I frayed and stamped as many of the silk strips, which I felt gave added contrast. Beading gives further added sparkle and texture. An embroidery stitch on my machine anchored it all together. Additional beads used on the binding. Dear Joan, this is a fun piece, the colours you have used are vibrant and eye catching. Well done. This is my Granddaughters favourite. 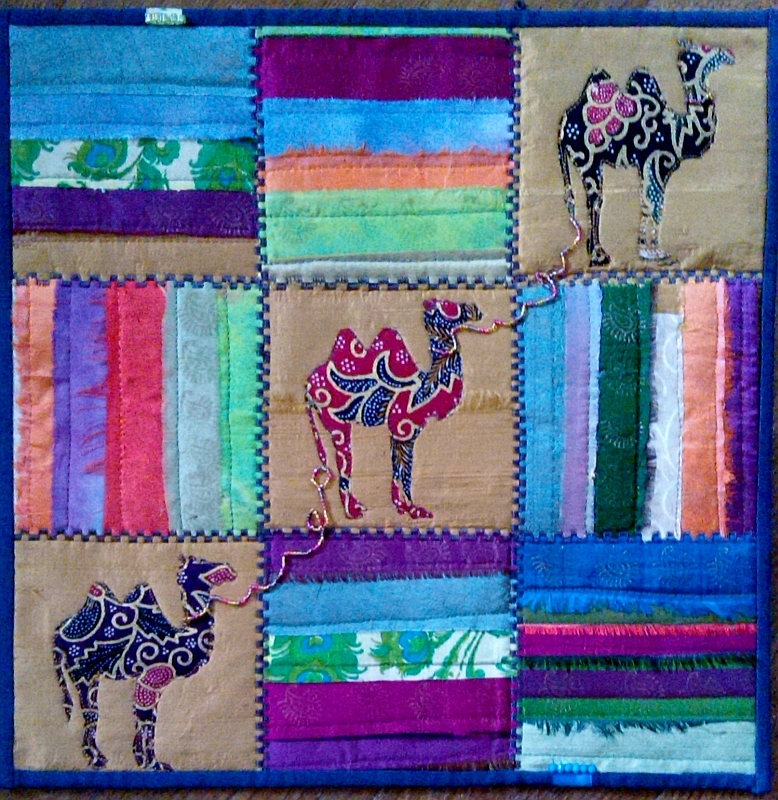 I love the idea of the Silk Road and your interpretation of the subject, great colours! At one point I had the idea to chose the silk road to interpret the theme but I changed my mind; I love your interpretation and your fabrics.